In Conche Harbour along the Northern Peninsula in Newfoundland, winter brings in the pack ice that keeps the residents ashore until it thaws. When the pack ice fills the harbour of the town of Conche on the Northern Peninsula in Newfoundland, Canada, many of the residents and their boats are kept ashore until it melts and frees up the harbour. 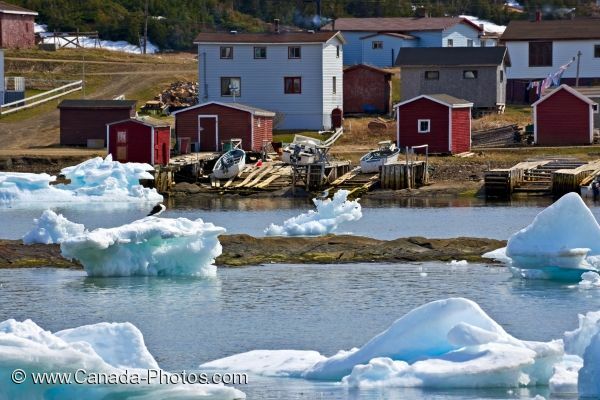 The shacks and houses in the town of Conche have a magnificent view of the harbour and can watch the pack ice change shape on a daily basis. When the pack ice first moves into the harbour, exiting by boat is not an option as some of the pack ice is fairly large and maneuvering around them is not possible. Pack Ice in Conche Harbour, Conche, French Shore, Northern Peninsula, Great Northern Peninsula, Viking Trail, Newfoundland, Canada. Picture of the pack ice that ventures into Conche Harbour on the Northern Peninsula of Newfoundland keeping residents stranded.